What is Intel Quick Sync Video? Different from Nvidia/AMD? When it comes to 4K Ultra HD video processing, scads of users would concern about the video decoding and encoding speed. Well, how to accelerate 4K UHD and high definition video decoding and encoding speed? Dead easy! Make your software and hardware have a good cooperation. That being said, how to make this happen? First of all, focus on your hardware acceleration. Next, resort to the video software that supports hardware acceleration. Okay, first things first. Let's get straight to the point - hardware acceleration. Hardware acceleration, as the name implies, is mainly talking about enhancing your computer hardware performance to complete some compute-intensive tasks more effeciently on hardware rather than only in software running on general-purpose CPU, which actually relies on your CPU and GPU configurations. GPU, we leave it for later clarification. This post primarily aims to bring you an insight on the most noteworthy Intel Quick Sync Video CPU hardware acceleration tech. What is Intel Quick Sync Video? Intel Quick Sync Video is the name given to Intel's hardware video encoding and decoding technology integrated into some of its CPUs. This type of hardware acceleration gives a great boost in high definition and 4K Ultra HD video encoding/decoding performance by routing 'work' to the GPU-being especially praised for its extraordinary performance in MPEG-4 AVC/H.264/H.265/VP8/VP9 video encoding/decoding operations. Thus, your CPU can be released to handle other tasks simultaneously with higher efficiency and better responsiveness. Certainly, with Intel Quick Sync Video hardware acceleration tech on your computer, you can do things faster than the basic CPU normally could. But please bear in mind that Intel Quick Sync Video tech would not go into action alone unless a video software with Intel Quick Sync hardware acceleration supported runs on your computer and activates the hardware to do a job together. In such case, if you wanna check how fast the Intel Quick Sync would be, you are demanded to get a Quick Sync video software first. There are some well-known Intel Quick Sync Video converters that support Intel QSV tech to compress and convert video (esp. large-sized 4K video) with 2-3X real time faster, including Handbrake (Windows), VLC media player, MediaCoder, MacX Video Converter Pro, Any Video Converter, etc. What's more, there are some other requirements needed to make Intel Quick Sync Video hardware acceleration workable in video processing. 1. The drive program should upgrade to the latest version. 2. The graphics card is required to be at least Intel® HD graphics GPU or Intel® Iris™ graphics GPU. 3. Your CPU hardware is asked to support Intel Quick Sync Video hardware acceleration tech. Check the below table if you're not sure about your CPU configuration. In case both your hardware and software address the above requirements, then you're able to utilize the Intel QSV CPU hardware acceleration to improve video processing speed. Well, here also comes a question: what if your computer CPU doesn't support Intel QSV? Does this mean you can't use hardware acceleration to speed up video transcoding? Yes, you can. You can adopt GPU hardware acceleration to give a great boost on high definition and 4K Ultra HD video processing speed. The common GPU hardware encoding techs include Nvidia (CUDA/NVENC), AMD APP and DXVA. 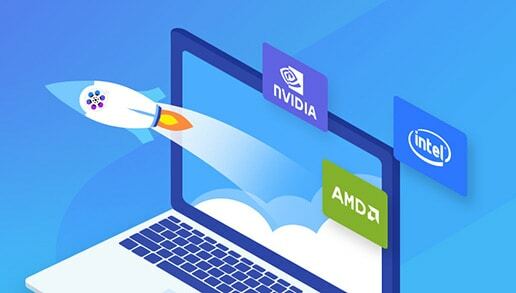 If you are in a great need of GPU hardware acceleration, then the following part might be helpful for you to get closer to GPU hardware encoding via the comparison between CPU and GPU hardware encoding acceleration techs. 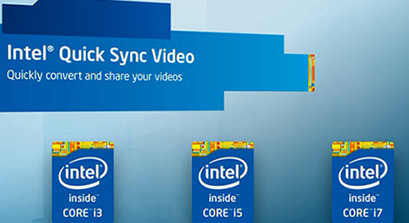 Now, we have almost finished the clarification about what is Intel Quick Sync Video. What if you wonder the relationship among Intel Quick Sync, Nvidia, AMD and DXVA? Here is the very place where you can get a clear understanding on the difference among these types of hardware acceleration techs. This type of hardware acceleration is to infuse an acceleration chip into your Intel Sandy Bridge/ Ivy Bridge/ Haswell/Broadwell CPU so as to quicken video decoding/encoding speed by routing 'work' to the GPU meanwhile leave more CPU space for other tasks like web surfing, video playback, etc. CUDA is one of Nvidia hardware acceleration technologies designed to ensure dramatic increases in software performance including 2D/3D games, video playback, video decoding and encoding, online video streaming, etc. by assigning some work to GPU. Of course, Nvidia CUDA will rely on CPU to some extent. Nvidia NVENC, the successor to CUDA, is a dedicated part of your GPU used to only hardware encode video (4K) at faster speed. That's to say, it doesn't play any role if the job is nothing related to video encoding. So, this GPU hardware encoding tech is specialized in video encoding and more importantly it takes almost no resource from CPU and GPU. Instead, it merely needs the minimum memory and bandwidth. AMD APP is the GPU hardware acceleration infused in AMD graphics card to cooperate with CPU chip to make tasks process faster than the former way only on CPU. Slightly different from Nvidia GPU hardware encoding, this AMD APP would hinge on CPU participation a little bit more than Nvida does. Of course, its purpose is the same to Intel and Nvidia, reducing CPU burden and making full use of GPU speciality. This type of hardware acceleration mainly focuses on transferring part of video conversion, edit or playback jobs to GPU (integrated or discrete) of your computer rather than CPU so that it won't slow down your other running tasks at the same time. The above hardware encoding acceleration might be different in performance, yet being identical in purpose-accelerate video decoding/encoding speed. Yes, the software has a big chance to be more efficient if it takes full advantage of all possible hardware acceleration techs for it's specific purpose, but that's also a lot more labor intensive to maintain and handle different possible roles for different hardware. Acceleration by assigning task to GPU, you can arm your computer with up to 2-4 GPUs (integrated or discrete) based on your computer settings. And compared with AMD APP and DXVA, Nvidia in general is at a higher level to help you encode video to H264 and H265 on wider platforms. Speaking of acceleration for CPU, you only have one option Intel Quick Sync Video to speed up and free up your unique CPU. Enhanced with Intel Quick Sync Video and GPU (Nvidia/AMD/DXVA) Hardware acceleration tech, MacX Video Converter Pro can easily process 4K video to H264/HEVC at 16X faster speed than before and 5-8X faster than any other tool. •4K Ultra HD Video Converter: convert any video (SD/HD/4K Ultra HD) to H264/H265 with hardware accelerated speed, up to 250FPS-320FPS. • 4K Video Compressor & 4K Editor: the hardware accelerated speed also applies to 4K video compression and 4K video editing. Thus, you can compress 4K to 1080p, reduce 4K file size via trim/crop at fastest possible speed. How does Hardware Encoding Affect on Video Processing Speed? Nothing is more direct than the actual test data. Check the specific speed test data if you wanna know the hardware encoding performance from Intel QSV, Nvidia NVENC, AMD APP and more. Is H264/H265 Intel QSV Hardware Encoding Available on Handbrake for Mac? The question of "How to enable Intel QSV H264 HEVC encoding on Handbrake mac version" is frequently asked on forum. Here this post tells you the answer if you can use Intel QSV on HB for Mac. Wanna compress and convert an 8GB large-sized 4K video to H264 within 5 minutes? If so, this hardware accelerated video converter is your primary choice. MacX Video Converter Pro, hardware accelerated by both CPU and GPU hardware encoding techs, can help you compress and convert large-sized 4K Ultra HD video to H264/H265 at 5-8X faster speed, making time-consuming chore a pain-free job.